Best Hobby for Introvert - The introvert needs activities that can make them comfortable. Introverted personality sometimes can be a real problem. Not because they do not like people, but introverts prefer to spend time alone while many people love to spending time with their friends. No wonder you know if the introvert people need activities that can make them comfortable. If you’re an introvert then here are some activities that can be done for you. It can be done through many things, whether you do not really understand art. Do you want to draw? Calligraphy? Making poetry? Do as long as it can calm the mind and reduce your anxiety, as well as your stress. Art, however, will help you to think deeply about what the meaning of beauty, friends, relationship, love, enemy, or even life. An introvert is one of a kind expert for it. Photography allows you to see the world from a different perspective. In addition, this activity also makes you interact with others. No need to use expensive cameras that spend a lot of money. Simply sharpen the ability of photography with mobile. Smartphone now is something that everybody’s must-have item, it usually includes the camera. So, you can make it as a pretty hobby since you’ll be able to take any picture wherever you’re. If you already know how to play a musical instrument, then focus on playing better. It is never too late to try and learn. Playing music is a good way to challenge yourself and set personal goals about how much you can be a master. 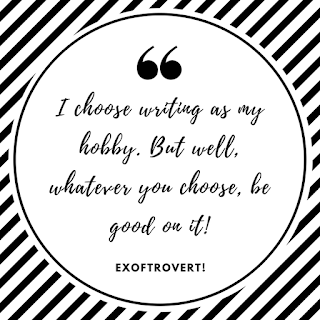 Writing is a hobby that is often done by an introvert because it allows you to express yourself. Writing also does not require you to involve others. And if you know that it has a lot of benefit for you. Here are some benefits you’ll get when you start writing. We can express our hearts well by doing writing. Writing can also express anything we want to convey without being afraid. By expressing everything, we can also help ourselves to be less depressed about the things we have gone through. This certainly can make our heart and mind become to feel more relieved and comfortable because we have been able to express about all fatigue that we feel. When we write we can be ourselves. Because we are free to be able to express, express what we want, what we want without having to take into account the opinions of others. Most of the writings describe how the original nature of the author. Whether they are hard-working, whether they are easy to give up / whatever will be clearly illustrated by the writing they have made. We can create a work that would be proud about. Moreover, if the work we made can be meaningful for those around us. When we have a work and get some interest by many people, of course, it will increase our dignity as a writer. In addition, we can be recognized as human beings who have good qualities in the eyes of others. Most of the people who overextend the problem in themselves tend to be depressed and stressed. Because if we are too often harbor a problem without express it, it will make us disturbed psychic and can be fatal. Of course by writing you can be helpful in terms of delivering all the problems that exist, rather than just keep it to yourself. Most of the people who are used to writing, they will have high confidence, good creativity, etc. This is certainly because they are used to being able to express a thing that is in them through a writing. By writing they certainly also train the creativity that is on him to make the writing that they have become interesting and interesting to read by the crowd. Its certainly makes us a better person by multiplying the writing and reproduce the insights we have. So, which one you'll choose to be your hobby, Introvert? 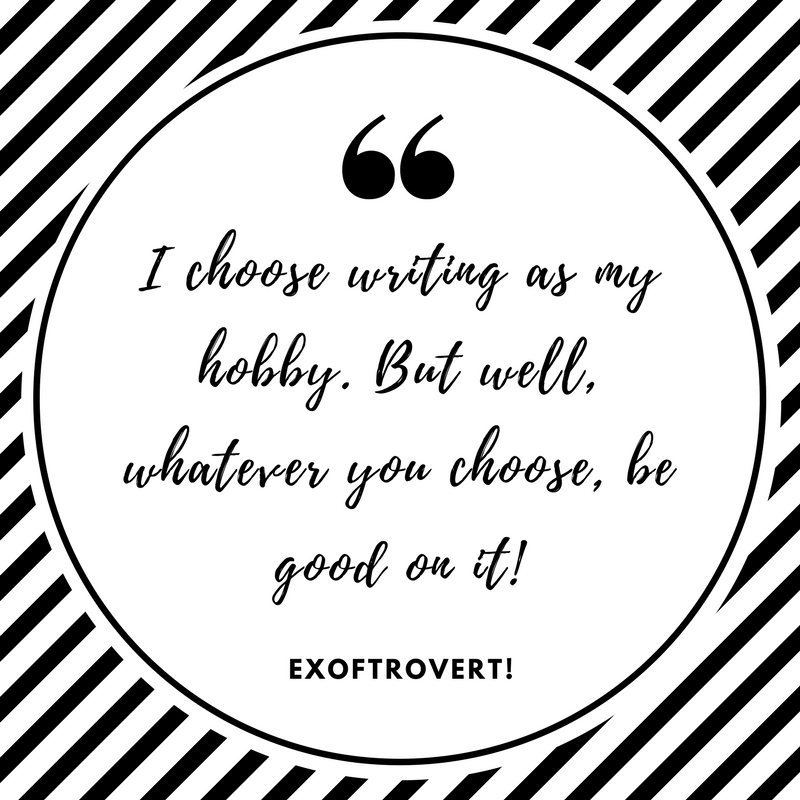 I choose writing. Well, whatever you choose, be good on it!